Introductory Maths: © Huw Dixon. 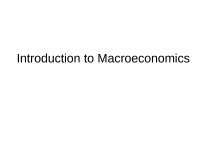 INTRODUCTORY MATHEMATICS FOR ECONOMICS MSC’S. 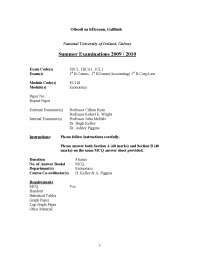 LECTURE 1: DIFFRENTIATION. o Open interval: includes end-points. (0,1) means strictly greater than 0 and strictly less than 1 o Closed interval: includes end-points. [0,1]. o Half open interval: includes one of endpoints, but not the other. [0,1) includes 0, but not 1.
expenditure etc. This is an approximation (cannot set a price ), but as in physics, seems to work well.  takes a real number (input) and transforms it into another real number (output).  y = f(x). You take a real number input x and it is mapped onto output y.
we look above, y=x2 is not 1-1. the output 100 can be generated by two values of x: +10 and -10. In Economics, we usually deal with the inverse demand curve, and treat price as a function of Quantity (Alfred Marshall, British economist in late C19th) That is why price is on the vertical axis! 3. Differentiation made simple. Differentiation was invented by Sir Isaac Newton, the great British 17th Century Physicist (Principia Mathematica). If you take a function and differentiate it, you get the SLOPE of the function. as x becomes very small. The Rules of Differentiation: Rule 1: Power rule. 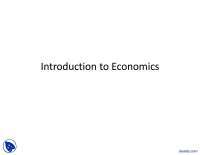 These are the basic rules used in economics: we do not need to use trigonometric functions (sin, cosine etc) except for very specialised uses. We then combine Rules 1-3 with further rules: these deal with differentiation of combinations of two functions f(x) and g(x). The aim is to take a complex expression (equation) and break it down into simpler parts f and g. Rules 1-3 can be used to differentiate f and g themselves, Rule 4: Product rule. we know the answer here: but the product rule gives us the same answer as the rule 1: it shows the rules are consistent! Rule 5: Function of a function (Chain rule) This is a widely used rule: you break down the expression so that there are two or more stages. (e) exponential The last rule is actually implied by the previous two rules, but we state it for convenience! Rule 6: quotient rule. To summarise: You take function. You use rules 4-6 to break down the expression into simple parts that you can differentiate using rules 1-3. 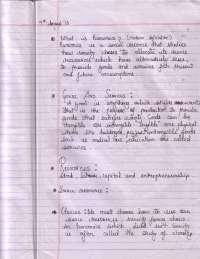 4 Economics applications. 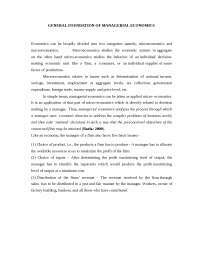 (a) Revenue and marginal revenue. Let us look at some particular demand curves: these are ones you will see used in economics often! a is the “intercept” term. It is the price when output is zero. Note that marginal revenue always has a slope that is twice that of the linear demand curve. Take the example of a=3. 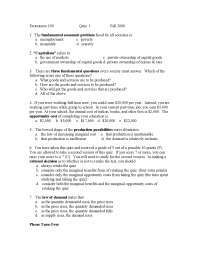 What happens to the elasticity along the linear demand curve? If x=0 (P=a), =. If x=a (P=0) =0. Demand curve 2: constant elasticity of demand. If =1, then we have a rectangular hyperbola: P.x=a. The Yellow line represents the unit elastic demand curve. Total expenditure P.X is constant. The red line represents an elastic demand curve: revenue is decreasing with price. The green line represents an inelastic demand curve: revenue is increasing with price. Revenue: output times price Revenue as a function of output. Marginal Revenue: zero if =1 (yellow line), strictly positive if >1 (red line) and strictly negative if <1 (green line). F: overhead cost, does not depend on output. Thus “efficient” least cost production occurs when AC=MC. 2 '' d y f dx  <0. The red line is the quadratic 22y x  ; the green line is the first derivative ' 2f x  . This is decreasing in x '' 2 0f    . A concave function has the following shape: if it is increasing in x, the slope is becoming less steep as x increases (see x<0 above); if it is decreasing in x, the slope becomes more negative (steeper – see x>0 above). A concave function is like an upside down bow or Hill…. The green line is the quadratic (A=-2): the red the first derivative. A convex function is like a bowl. Note that the negative of a concave function is convex: if f(x) is strictly convex, then –f(x) is strictly concave and vice versa.